Paul Mascareñas is a new Reference Librarian at Dayton Memorial Library. 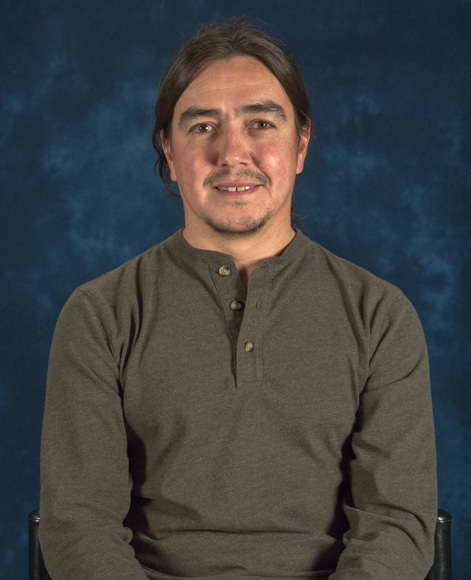 Prior to Regis University, Paul was a Distance Services Librarian at Colorado Mesa University in Grand Junction, CO and a Reference Librarian at Adams State University in Alamosa, CO. Originally from La Junta, CO, Paul cannot picture living anywhere else but in beautiful Colorado. 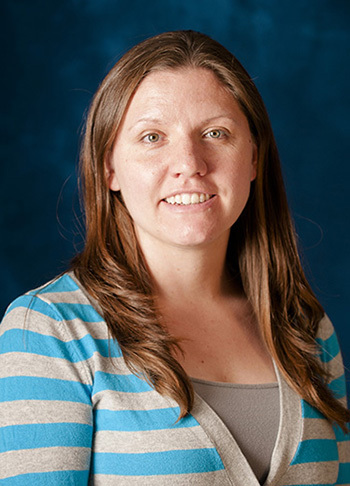 Lindsay Brownfield is a new Reference Librarian specializing in Health Care. She comes to Regis from Nebraska Wesleyan University in Lincoln, NE. Lindsay grew up in the Nebraska Sandhillls and is excited to explore Colorado. The library’s 24/7 Chat with a Librarian service is also closed on Thanksgiving Day (November 28th). Regular hours resume on Saturday, November 30th. As part of its Bridging Cultures Bookshelf: Muslim Journeys grant, the Regis University Library is pleased to present Muslim Journeys through Art, an exhibit featuring three Colorado artists. 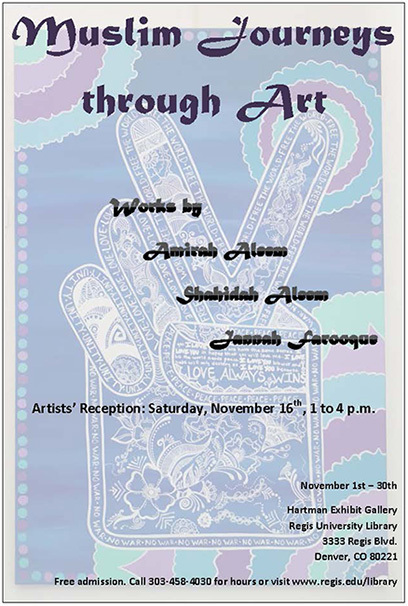 Using painting (Jannah Farooque), photography (Shahidah Aleem), and traditional henna design (Amirah Aleem), these artists explore themes of belief, love, and the beauty of creation. Books on Islamic art from the library’s collection, including those provided through the Bridging Cultures Bookshelf grant, are also on display. The exhibit will be on display through November 30th in the library’s Hartman Exhibit Gallery and fireplace lounge and is open during regular library hours. Public reception: Saturday, November 16th from 1:00 p.m. to 4 p.m. This exhibit is second in a series of programs celebrating the Bridging Cultures Bookshelf: Muslim Journeys grant, sponsored by the National Endowment for the Humanities in cooperation with the Ali Vural Ak Center for Global Islamic Studies at George Mason University and the American Library Association Public Programs Office. The grant consists of 25 books, 4 films, and a year’s subscription to the Oxford Islamic Studies Online database. All resources are available at the Regis University Library. Where in the world is the Dean of the Library? Janet Lee, Dean of the Regis University Library, is joining noted author and storyteller, Anne Pellowski, in conducting workshops on producing cloth books for children in multiple languages in Addis Ababa and Mekelle, Ethiopia. As side trips, Janet plans to visit the libraries at the African Union, St. Mary’s College, the Dr. Thomas Hooyman Memorial Library and Media Center, Segenat Children and Youth Library, and the Axumite Heritage Center. You can follow Janet’s travels on facebook. Posted in library staff and faculty | Comments Off on Where in the world is the Dean of the Library? The Catholic Research Resources Alliance (CRRA) is a not-for-profit membership alliance of institutions colllaborating to provide access to rare, unique and uncommon Catholic research materials which are held by libraries and archives in North America. Currently, there are over 35 member institutions, including Regis University. The Catholic Research Resources Alliance (CRRA) Portal, or “Catholic Portal,” provides a searchable interface for access and discovery of rare, unique and uncommon Catholic scholarly resources. The goal of the Catholic Newspapers Onlineprogram is to provide access to all extant Catholic newspapers in North America. You are currently browsing the Regis University Library news blog archives for November, 2013.